There are plenty of web sites for wrecked muscle cars. Each with its own twist of what happens. I love the Mopar’s but it is not the reason I picked this picture. Whether you have a ‘bird, a ‘Stang, or a Camaro it does not matter. The facts are this regarding these older classics. It’s usually the driver, not the classics fault. It’s texting, or just plain dumbness. They ran a red light, got distracted or plain don’t know how to handle the vehicle. Now the new hot rods are different. They have huge horsepower and everyone wants to test it. The Mustangs coming out of a car show or a Hellcat in a straight line, either way these drivers many times cause their own problems. But generally the guy farting along with his ’34 Plymouth street rod gets whacked for other reasons. One must drive super defensively when driving a classic. 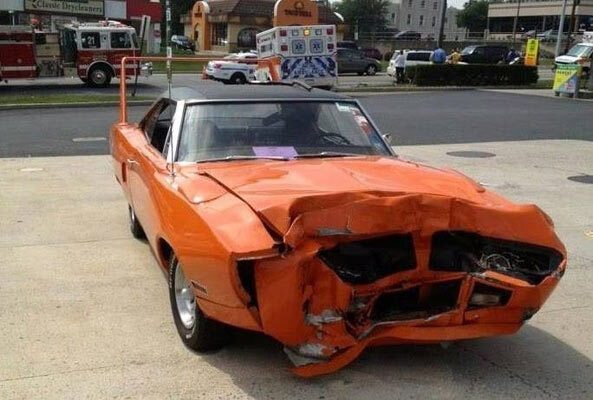 It hurts deeper when you wreck your 67 Camaro. Who do you trust to fix it? We generally have a hard enough time finding someone to tune the engine on our classics. But when you get T boned the problems magnify themselves ten times. So, drive your classic differently. Be alert at all times. Never assume anything. That is one good thing about some of my older cars. They are too darn slow even at top speed to get in trouble. My newer classics are another story. They easily can get me into all kinds of trouble. Either way, heads up, ears open, sit up, look around at all times, and pretend everyone on the road wants to hit you like you were driving a bumper car. Stay safe my friends. Where have we heard that line before?